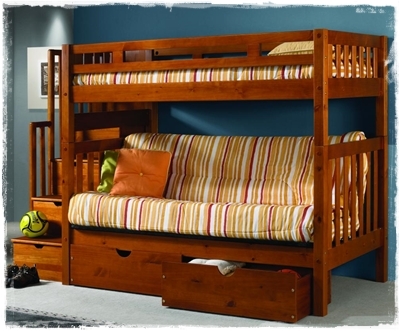 Wooden futon bunk beds make the perfect bed for small apartments, dorm rooms, tween, or teen bedrooms. The top bunk is usually the sleeping bed and the bottom bunk is usually the couch bed. If not needed for sleeping, it becomes the permanent couch that easily converts to a full size bed for occasional over night guests. Often, futon bunk beds have built in steps for storage and they often come with options to add under bed drawers or a trundle bed making them even more space saving for small rooms. 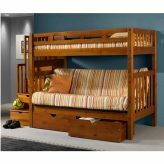 Natural beauty , under bed drawers, steps to the top bunk with under step storage make this bunk bed couch an all in one piece perfect for a small apartment or dorm room.